Here you will find products and services that I know, like, and trust. In most cases I have personally invested money in and feel they are well worth the investment. I’m certain you will enjoy them as much as I have. I was fortunate to be one of the relatively few that John offered the course to in 2014. This course is not your traditional X’s and O’s course. It is all about things such as the psychology of performance and leadership, how to build a winning team culture, and even how to educate your team parents so they don’t drive you up the wall. I particularly love the interviews with some of the world’s leading experts in sport science and psychology, coaching, and leadership. This course is different, the things you will learn in this course are on another level than what I’ve seen in the past. Unfortunately registration has passed but I recommend you still check out the free video series by clicking here. I first heard Bobby Tewksbary on the Diamond Dreams Podcast in March 2015 sharing his thoughts about how modern American hitters are too mechanical and less athletic than the Latin hitters who are dominating the game today. I agree with Bobby when he says today’s hitters are being taught swings that promote contact instead of power and that that by limiting athleticism coaches are limiting the hitters ability to drive the ball. 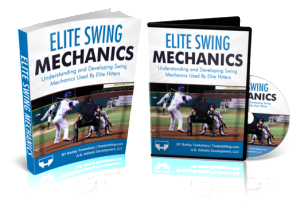 Elite Swing Mechanics eBook is the foundation of information Tewks uses with his pro clients and with all of the college, high school and youth hitters (baseball AND softball) he works with. Grab your copy here. 4-step training strategy packed with swing-transforming online videos your hitters can watch at their convenience, to rapidly and massively improve their batted ball distance. These modules are optimized for mobile devices, so your players can take advantage of the power of this training at home, on the go, or even in the dugout. Okay, probably not in the dugout but click here to learn more. Note: Some of the product and services below are affiliate links which means if you purchase them, I get a commission, first born child, pony, or some other amazing bounty. You can rest assured I only promote things to you that I think provide value.